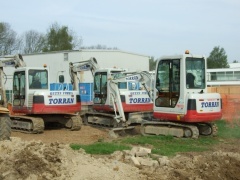 Torran Construction Ltd has a fully trained workforce. All Operatives are CSCS certified and all Plant Operators are CPCS certified. Training is carried out on a continuous basis to ensure full compliance with current industry requirements. We operate our own Plant Fleet which is regularly maintained and replaced, as required, to maintain high standards of safety and reliability. Torran Construction Ltd work mainly as a Specialist Sub-Contractor on large developments. We also undertake Contracts as the Main Contractor and have our own Internal Development Projects. Bulk Excavation, including Cut & Fill operations. Foundation Works, including RC Basements.